Product categories of Battery Smart Pulse Restore System, we are specialized manufacturers from China, Battery Smart Pulse Restore System, Battery Pulse Protector suppliers/factory, wholesale high-quality products of Pulse Tech Smart Battery Chargers R & D and manufacturing, we have the perfect after-sales service and technical support. Look forward to your cooperation! VoltaTech's patented Composite resonant pulse technology is the best in the world , Through intelligent pulse being resonant with sulfated crystals, restore battery vitality, and prolong the service lifespan of the battery without any damage to the battery physical structure and plates. Battery Smart Pulse Restore System fully take into account the inconsistent of the physical resonance frequency between lead sulfate crystal and battery plates, select the optimal frequency of pulse waveform and pulse current intensity to "break" and "decompose" the lead sulfate crystals, ensure the best restoration effect of sulfide battery without any damage to the plates. Off-line Battery Smart Pulse Restore System also be called Battery Pulse Rejuvenator or Battery Life Saver: mainly used in the whole industry of electric forklift industry, Logistics, Sightseeing car, Golf Cart, Marine applications, wind and solar energy storage applications, UPS Back up power system, Telecom base site, State Grid and Military battery for Sudden affair, Deep cycle and Stationary battery etc. 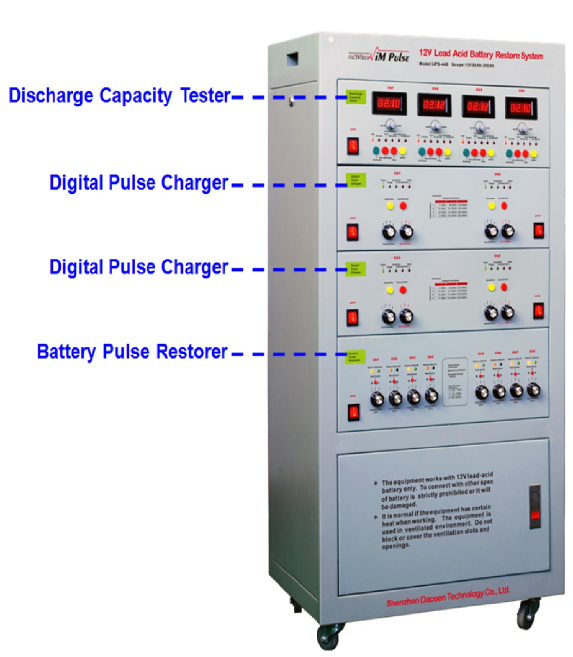 The system is composed of 3 parts and a professional standard restore process: 1) Restorer Device; 2) Digital Pulse Charger; 3) Discharge of Capacity Tester. Lead-Acid Battery Restoration system and Solution is applicable to all of Lead Acid Battery(AGM, GEL, VRLA, MF, Flooded, Dry, Traction, Deep cycle and Stationary), and widely used in 2V(200~3000Ah)/6V12V(4.5~300Ah) cell batteries. We committed to providing the lead-acid battery pulse restore system and solution for users, including: off-line repair and restore device, professional routine maintenance, and on-line Battery Protector System.